Global franchise brand Signarama, which retails custom signage through stores and showrooms, has launched its Light franchise package with a goal of offering aspiring business owners “a more affordable entry point to the industry”. Franchisees using Signarama’s Light model operate showrooms that are “fitted out exactly like other Signarama centres, but without the production equipment”. This means the footprint generated by the showroom is smaller, therefore attracting lower rent costs and business rates. The franchise says that, with production outsourced to suppliers beyond the showroom, franchisees are able to focus more on driving sales and delivering the best service they can. New franchisees who invest in the Light model are expected to benefit from collective buying power, training and support, and technology and software innovations from the brand’s research and development department. 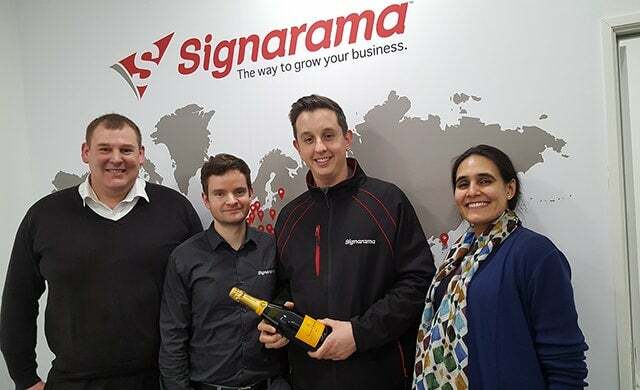 Signarama franchisees in Birmingham South, Reading, Harrogate and Preston reported record-breaking figures for 2017, with some achieving a staggering 76% increase in turnover from 2016. According to the franchise, network sales are up year-on-year with some franchisees seeing a 25% uplift. The brand says this success is “a testament to the continued passion and drive from each and every one of our franchisees”. Founded in 1986, Signarama claims to be the largest signs and graphics franchise in the world. It has been enjoying consistently high demand for its services, with businesses continually launching, expanding and relocating and so requiring new and unique signage which helps them stand out in a challenging economic climate. Aliyyah-Begum Nasser, managing director at Signarama, commented: “We wanted to open the opportunity up to a much wider audience. Tracy Andrews, Signarama franchisee for Birmingham South, added: “There’s no question that being part of such a well-known Global brand can open certain doors for you. Often the impression of size and national reach is very instrumental in larger clients trusting you with important and high value projects. Find out more about becoming a franchisee with Signarama here.